We’ve come to the fourth week of our celebration of September as National Sewing Month! 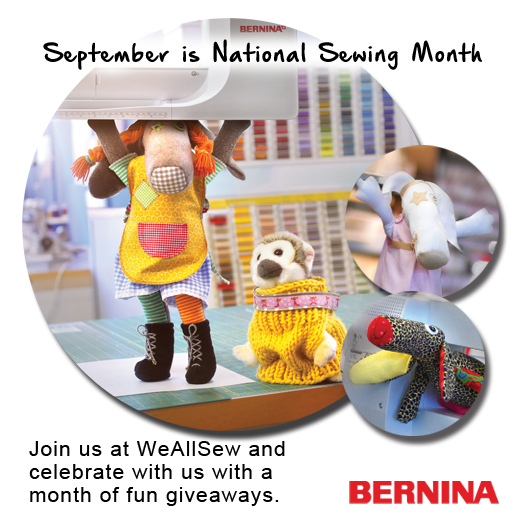 Join BERNINA at WeAllSew as we celebrate all this month with super sewing giveaways! Come visit us each Friday in September to join us in sharing our love of sewing while entering a random drawing to win a BERNINA backpack filled with sewing goodies. We loved reading all your comments on last week’s question, “Who taught you how to sew, and have you taught anyone else to start sewing?” We love that so many of you are passing on your love of sewing through teaching others how to sew. We’ll draw a winner at random from all your comments and we’ll let you know who the winner is as soon as we contact her/him. Where would you like to take your machine on vacation? Who else would you take with you, or would it just be you and your machine? Sweepstakes Rules: Open to residents of the 50 United States and the District of Columbia. One comment per fan. Comment must be submitted to the WeAllSew.com blog by Thursday, September 25, 12:00 midnight Central Time. Winner will be chosen randomly. Winner will be notified by email and will have 48 hours to contact us at WeAllSew@berninausa.com to claim the prize; winner will be announced on WeAllSew about one week after contest ends. Congratulations to our contest winner, WeAllSew fan multicrafter! 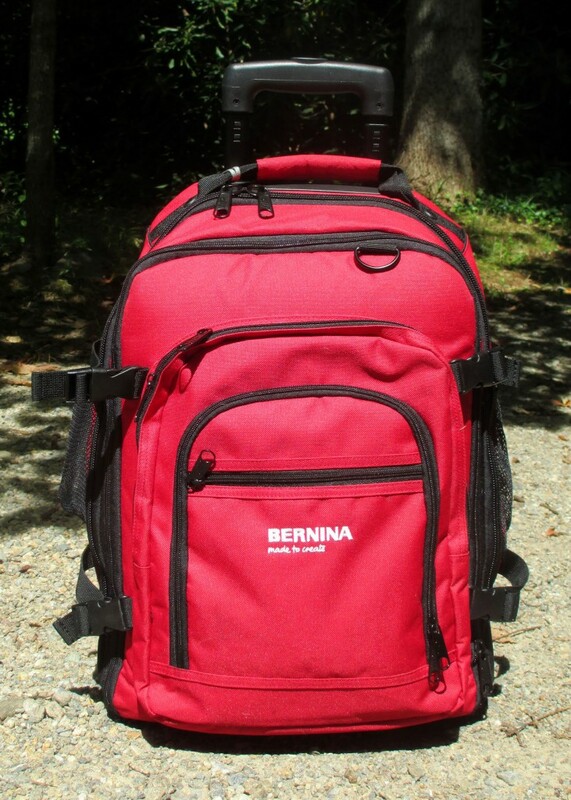 Have fun with your new BERNINA back pack and sewing goodies, and thanks for celebrating National Sewing Month with BERNINA! I would like to take my machine on a VERY LONG vacation to Hawaii. I would need to have enough time to enjoy the area as well as getting in some good sewing time! I would go with my 3 quilting friends who get together with me every month for a fun and sometimes productive sew day. Just me and my machine baby! Oh, I would take it on a sewing retreat vacation with classes where I could learn to improve my skills. Just me and my machine. I would take my machine to one of those sewing conferences that I’ve always wanted to go to. I wouldn’t take anybody with me, I want the ME time. I’d love to take my machine and a quilting friend to a house overlooking the Atlantic Ocean with a huge screened in porch on the ocean side. I’d quilt on the porch and listen to the roar of the ocean and hopefully be up in time to see the sunrise. I need a friend along to share supplies, techniques, quilting stories and of course suppers with a glass or two of wine. Heaven. Minimum retreat…one week and two weekends. I would take my machine to Ireland. I’d go by myself and sew in peace. I would take my sewing machine to a mountain retreat to learn new quilting skills. It would be only me for two weeks. I would take my new 880 to Mackinac Island, Mi. and stay someplace where I had a view of the Straits of Machinac and then sew to my “hearts content”! I would take my best friend who is my husband; he has always supported me and gone with me to various sewing events and quilt shows. He would always pick his favorites. I would love to take my machine somewhere with mountains, in the fall season where I can the see the leaves on the trees changing color. But I would also like there to be quilt shops around where I can get more inspiration and buy supplies if needed. I would love for my 2 best sewing friends to join me but I am also okay with just me and my Bernina. San Francisco would be my destination, for a Power Sewing Retreat. I would love to have my sewing buddy go with me. She is retired and very busy so I might have to go it alone with my Bernie. I would love to go to Aurora, IL, where my BBF lives, and take my sister who is a sewing genius and my brand new 780e! I used to sew on vacation when I visited my mother. Since then, although I shop for fabric, I have not sewn while away from home. ( My B710 is a bit bg to travel with) I’d love to be able to sew or quilt while my husband is out doing his photography since I find my time traveling is often when I have the most creative ideas! Rent a house near the mountains where we would all fit, that has a view. And then spend a week quilting, bonding, taking in the beautiful scenery, and relaxing. I’d take my machine to a brand-new sewing room, so I wouldn’t have to pull out so many boxes when I start to sew. I would love to take my machine and 2 sewing friends to Hawaii for sewing and quilting classes. Then I would love to have some of the beautiful Hawaiian fabrics to let my imagination run wild! I would take my machine to a cottage overlooking the sea. I would take my husband so that he could cook dinner and pin hems for me. I think I’d like to go to Greece or Italy, and I’d take my quilting buddy with me! I would love to take my 430 on one of those quilting cruises in Europe. It would be so amazing to travel around with other quilters while also getting to soak in the sewing cultures of other countries. Of course, I would take my sewing partner in crime, my Momsy. Her skills at putting different fabrics together is something I aspire to reach, and her sense of humor is killer! I would like to take my sewing machine on vacation with me to the garment district in Los Angeles. That way I would have access to lots of great fabric and accessories. I’d take my mom with me since we like to go to the garment district together. I’d head to Colorado or Wyoming to a mountain cabin with a fireplace. Sewing in the mountains by a fire would be heavenly especially if my hubby was along! My Bernina and I, alone together, in a log cabin — with electricity, heat, and the comforts of home (of course) — overlooking the woods and wildlife, in quiet solitude, creating our best ever. I would like to take my machine to a tropical island. I would love to have my Mom along. So we could sew together. I would love to go to New York, take a fantastic fitting class and spend a few hours wandering around Mood. Then head back to the hotel and sew, sew, sew. I’d take the hubs with me. He’d be bored as all heck, but if I left him at home, who would carry all my fabric purchases??? I would love to take my machine to the Empty Spools retreat at Asilomar, and I would take one of my best quilting friends. Great teachers, a beautiful location, and sewing all day is one of my favorite fantasies! Thanks for the chance to win! I would like to take my machine to my daughter’s and enjoy sewing with her. I would love to take my machine with me on a summer-long vacation to Israel and Greece. Were I to be dating or married to someone, I’d take him with me. A mountain cabin. I’d take my mom and I want Internet access to show her all the patterns and tutorials available. The only sound would be nature, sewing machines, and quiet conversation. Sew soothing.! I would take it on a quilting retreat along with my husband as we don’t like being apart for too long. I’d also be able to take the one day classes my guild has FINALLY! At the moment I’m limited to classes where machines are provided. I love my BERNINA so being able to go to retreat with my machine would be magnificent! I would probably have a stay-cation so all my “stuff” would be handy, and just myself so no interruptions! I would take my machine to the Winston-Salem, NC area to return to sewing with wonderful women who saved me during a rough time in my life, Carolyn and Regina. I would take my machine to a mountain cabin and sew from dawn til dusk. I would like to take my machine when I visit my parents so I can sew with my mom. I would take my machine, lots of fabric and go to a cabin to sew my next quilt!!! I would probably take my Mom with me! We enjoy spending some quality time together and don’t get to do that often enough. She’s not a quilter, but I value her opinion of the over all project. Thanks for the opportunity!! I would like to take my sewing machine to a place on a beach where I can look out on the water and enjoy the view. I would take my sister with me who also quilts. I would like to go to Virginia Beach to hotel on beach with large private deck. I would take my sewing friend – Lee and my sister – Pam. We would sew and laugh and have the best time in the world. What a wonderful idea. I’d love to take my Bernina to the mountains way up high where it’s very private. I’d take my husband and we would rent a cabin by the beautiful river………sigh. I would love to go back to Salzburg and sit in front of the window of a hotel looking over the narrow city streets in the early fall where you get that cozy feeling from the brisk weather. I would definitely take my husband and son for inspiration and time balance. A cabin in the mountains! I would love to take a vacation to a beach and take my granddaughter. I’m teaching her to sew and we could have so much fun! I would take my Bernina to my friends house in Bend,OR where our group, The Blocksmith’s meet every July for the Sister’s Outdoor Quilt Show. Great friends and great sewing, doesn’t get much better than that! I would love to escape with my Berninas to my “longed wish for” sewing studio that I want built on my farm! I would enjoy the company of my sewing friends here in town! It could be our get away trip we have wanted for a long time! I would take my machine along with lots of fabric and go to a cabin to sew my next quilt!!! I would probably take my Mom with me! We enjoy spending some quality time together and don’t get to do that often enough. She’s not a quilter, but I value her opinion of the over all project. Thanks for the opportunity!! Asilomar California for the Empty Spools retreat. Would be fun to go with my sisters and good quilting friends. My Friends and I to the Outta Banks for a week with our machines. Or NH in the fall. Sew Sew Sew… Life would be good. I would take my Bernina to visit my dear friend, Cat, so that we could sit and sew together. No kids or how would I get anything done?! I would love to take my machine to Alaska for an extended vacation with it and my two quilty friends! We would love to sew and sightsee together. I would take my Bernina to a quilting retreat featuring some of my favorite teachers. Me, my friend Terry and our Bernina’s to a cabin in the mountains! I take my machine to the Taos Ski Valley in New Mexico for several weeks for our annual family ski vacation. All the kids and grandkids come. I sew while they all ski. Couldn’t be any better than that. I would love to take my machine to the Bernina design center in Aurora I’ll. I have made my reservations to attend the Quilt Show in Rosemont, IL next March. We are taking machines to sew in the hotel after we make fun purchases and we could fill up the backpack and take the new machine on the trip with us! My daughters are traveling with me! Nothing like a quilting weekend and a quilt show to relax! I would take my machine and my sister to a hotel near my sister’s home in Virginia and sew up a storm together. We are both happy, energetic breast cancer survivors and don’t get to see each other often. When not sewing garments or quilts we would visit area quilt shops and return with our goodies and make something matching to remember that special ‘vacation’! What a wonderful contest that encourages such happy thoughts and spurs them into action, even if not the official winners. Thank you! I would go to a mission in Haiti with three sewing friends. We would take our machines to this poor country and sew quilts and children’s clothes for the people. I would take my machine to a lake cabin. There I could be inspired by all the nature around me as I made my creations. I would bring my husband with me for company while I sewed. Just my machine in a nice cool place. I would take it to Switzerland so it could visit it’s family. I would take my machine to our mountain cabin where there are no phones or internet or tv to interrupt my concentration! Taking my machine to Nashville to sew, appliqué, monogram & embroider for my “3” loves … My Grandbabies … 3 yrs, 2 yrs, 1 week! I would take my Bernina on an island vacation (Mackinac Island . Michigan) where I could explore the island and then return to my room at the Grand Hotel (with a view of the lake) and sew for hours. I would take friends with me, but only friends who love to sew and quilt on a Bernina. Oh my–a beautiful solitude retreat area—-with my quilting friends, a few bottles of wine, some one to cook, a driver to take us on a shop hop run (just in case we needed some supplies) and an open mind to bond, sew and take in the beauty of the place and thank God for the gifts I have been given. I’d travel to the “Sisters Outdoor Quilt Show” with my sister. When we last met for a weekend hotel stay, she showed me a sewing technique and we went on a fabric shop hop. If I were going on a sewing vacation, I would take my 2 best sewing friends with me and all our machines. I would love to take them down to Lake Mary Fl. To sew and shop. And of course visit the Bernina dealer there in Lake Mary. I would take my Bernina to a cabin on the Kenai river in Alaska. I would bring my husband, and my sister & her husband. We girls can spend our time sewing, while the guys go out to do some salmon fishing during the day. July is a good time to be in Alaska, since you have 18 hours of sunlight. Love the site. Thanks food all the inspiring articles. I would love to take my Bernina to a cabin in the mountains with my sister and my dear friend Cheryl. What fun that would be sewing with a view of beautiful tall pine trees and the best company in the world! Actually headed to a quilting retreat th s weekend with over 100 qualifying friends. it would be me and Bernie!!! and I would love to go on a retreat somewhere very beautiful where I don’t have to do any housework for at least a few days! I would take my machine to Napa, and I would bring my mom along. I take my Bernina with me on fishing trips with my husband. He goes and molests the trout and I sit in a lovely air conditioned suite with my Bernina and create away! Its a win win situation – unless you are a trout! I would meet with my cousins in Forest Lake Mn and enjoy our quilting adventures. It had always been a wonderful time. They are genuinely great people and we learn something every time we get together thanks to Joy and Aunt Gen. If not there a lake cabin for the evenings. I follow on pinterest. I am a novice sewer so I would like to see tutorials on zippers, button holes, using binding tape. Believe it or not, I’d bring my hubby along. He’s the driver and logistics man. I can count on him for anything from food to fixing up whatever needs fixing. That leaves me to sew, craft, create! I love making quilts, so a trip north to some beautiful valley in the mountains with maybe a dusting of snow would be wonderfully perfect. We could snuggle under a warm quilt….when I’m not stitching one on the Bernina! I would go anywhere with electricity or a generator so I could sew while I traveled. I think I would take my sewing machine repairman. He deserves it after all these years we have been together! Of course, there should be a quilt store nearby when we stop for the night just in case! I would take my machine with me to a lake house so I could be near the water and look out onto it as I cut and sew. It would definitely be calming when I make little irritating sewing mistakes. It would make seam ripping a lot more interesting! I’m going to Baltimore to babysit for my first grandchild in October and I wish I could take my Bernina because that baby girl is so inspiring. There are so many things that I’d like to make – and embroider – for her. I am sewing for her here at home, but it would be so gratifying to make something in the evening and dress her in it in the morning. I see for myself, for now anyway. Summery tops are what draw me the most. I sew for myself, for now anyway. Summery tops are what draw me the most. I mainly sew for others – made 5 Nativity Advent calendars for our grandchildren. Also like to do wall-hangings and table runners and of course, mending my farmer husband’s blue jeans. I mainly sew quilts for family and friends. I sometimes get requests for alterations and clothing repairs but it is not my favorite task. I sew quilts- table runners, baby quilts and bed quilts. I make quilts for the neices and nephews high school graduation, so they go forward with love.